The inquisitors questioned them with authentic incredulousness on their effort to stem the radicalization of members of their communities and lecture them on the need for their communities to be even more obsequious, even as their communities face escalating violence and police state intimidation. The obvious contradiction between the supposed American values of tolerance, freedom of religion, individual rights and non-discrimination and the demand that the spokespersons surrender those rights in order to prove loyalty is lost on the inquisitors and the audience who have come to expect members of minority communities to perform humiliating rituals for the psychological comfort of the majority. The consequences of Islamophobia and anti-Arab sentiments have been dramatic, infecting the whole culture and all sectors of the population. Even in the African American communities anti-Muslim sentiments are increasingly voiced, which is particularly interesting because until recently African Americans made up the largest and oldest Muslim population in the country. There are comments about the “A-rabs” and Muslims exploiting black people and some have even gone so far as to give support to the social discrimination and governmental monitoring of Muslims by state authorities. Individuals who hold those views don’t quite understand that calls for more monitoring, control and curtailment of the rights of Muslims on the part of the state is no more than the “niggerization” of these communities. What this means is that, if accepted and normalized, it only increases the certainty that repression in black communities will continue to intensify as we are also increasingly identified as a “radicalized” internal enemy. That is why the hypocrisy of political leaders in the U.S. is so galling. The de-valuation of Arab and Muslim lives has been an operative principle of U.S. policies in the Middle-East since it became the hegemonic power in the region. There is not much space between Hillary Clinton’s joke about the murder of Muammar Gaddafy – “We came, we saw, he died” – which of course took place during a murderous NATO assault on Libya that by conservative estimates killed tens of thousands, and the positions of various governors on the issue of Syrian refugees and even with Donald Trump’s latest proposal to temporarily ban Muslim immigration. Yet we are supposed to believe that these leaders are now outraged about Trump’s comments. What African Americans must remember is that before the post-9/11 criminalization of Arab and Muslim communities, the playbook for how to police and repress a captured community was written in our communities. Before the registration of young Arab and Muslim students after 9/11, local police forces compiled massive biographical databases of young African Americans as a means of monitoring so-called gangs and controlling crime. 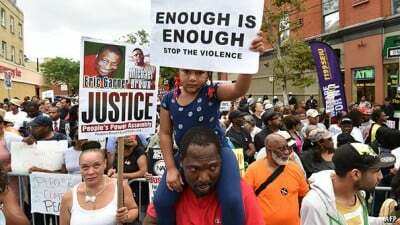 Stop and Frisk, mass incarceration, police executions, torture, governmental infiltration of our organizations, raids, house to house searches, were perfected and normalized in our communities. The systematic state terrorism being carried out in Muslim communities in France today under their state of emergency and the criminalization, social ostracism, violence and official discrimination directed at Muslims in the U.S. today will be most certainly directed at black activists and our communities tomorrow when the state and public opinion turns against the latest expressions of black opposition popularly characterized as the black lives matter movement. That is the terrible reality that we know is coming our way. And those of us who will maintain an unrelenting critique of this sick society and the oppressive apparatus will be labeled as the “radicalizers” of this black opposition. What was once labeled as racist demagoguery in the short liberal post-war period has now been rehabilitated and given a new respectability in relationship to Muslims and Arabs. Since the attacks in Paris and San Bernardino, individual Muslims have been assaulted, mosques firebombed and threats sent to Muslim community and civic organizations with almost no coverage from the corporate press. This lack of concern for the human rights of Arabs and Muslims reflects the fact that their lives, like the lives of black people, don’t really matter. Is there any other way to explain the still overwhelming support for Israel and even the dismissal of Bernie Sanders commitment to continue Obama’s drone terror program even though it is clear that thousands of non-white innocents have lost their lives as a result? We must have no illusions. The “orientalist” construction of the Arab that occupies the consciousness of Westerners as blood-thirsty, violent, irrational with a strange sexist religion is just the flip side of the racist colonialist coin in which global anti-blackness is on the other. Both constructions make the Arab-Muslim and the black “killable.” And when you are both black and Muslim, it is a deadly combination that can end up in a situation that Iman Luqman Abdullah faced in Detroit when he was murdered by FBI agents. Totalitarianism applied to specific peoples can exist side by side with the current practices of liberal democracy especially when the majority is unaware, silent or both. Like the Palestinians who reached out to the resisters in Ferguson to counsel them on how to deal with the Israeli trained police forces, we can and should reach out to Arabs and Muslims in the U.S. to share with them our experiences surviving racial totalitarianism, so that we both can learn and survive together. But collective self-interest is not the main motivation for why African Americans should oppose the growing neo-fascist sentiments and legislative policies directed at Arabs and Muslims. Opposing efforts that expand the repressive power of the state and undermine the fundamental human rights of individuals and groups is consistent with our history and principles. This stance represents the foundational principles of the black radical tradition. Opposition to all forms of individual and collective oppression is the mandatory call to action for this tradition and serves as the basis for attempting to establish relations of solidarity, even if that solidarity is not returned. So in the face of the growing repression of this community, we must stand with our Arab and Muslim brothers and sisters. We know from our painful history that within the dark corners of the imagination of the racist settler-colonialist, Muslims are today’s Native “savages” and rebellious niggers that are both feared and hated as an existential threat.